I LOVE Thanksgiving. I love eating Thanksgiving food. I really, really love making Thanksgiving food. I look forward to it all year every year. But as mentioned in a previous blog post, we are not making any diet exceptions for the holidays this year. GAPS is obviously too crucial for Little Guy for us to take any time off. But GAPS doesn’t mean we can’t have a fabulous Thanksgiving…just as fabulous as anybody else’s. I have also been brainstorming and surfing the Web for days, trying to put together a perfect, GAPS-friendly Thanksgiving dinner that would also satisfy everybody’s key holiday cravings. Here is what I’ve come up with….and thanks in advance to all of the wonderful bloggers who provide recipes to those of us on this journey! I am so grateful to have access to your creativity! LONG week. Kiddos have been sick all week and now I seem to be coming down with it too. I have a few things to write about (including our new acorn squash pudding, our new favorite yogurt–piima, our beautiful meat haul the other day, and the local turkey and goose we will be obtaining for the holidays), but I am too tired. Hopefully things will normalize in the next day or two and I will be able to catch up here and around the house. The one thing I can’t help but mention is this amazing, wonderful, delicious, beautifully textured (shall I go on??) GAPS friendly BREAD from the lovely blog Nourished and Nurtured. Wow. It is made from a combination of almond and coconut flour, and holds its texture so well that Little Guy can even have his beloved grilled cheese sandwiches again! We all loved it and will be making it at least weekly from now on, I’m sure. Thanks again, Sarah. So here’s this week’s menu. There are a few things I am kind of excited about….I will let you know next week how they go. 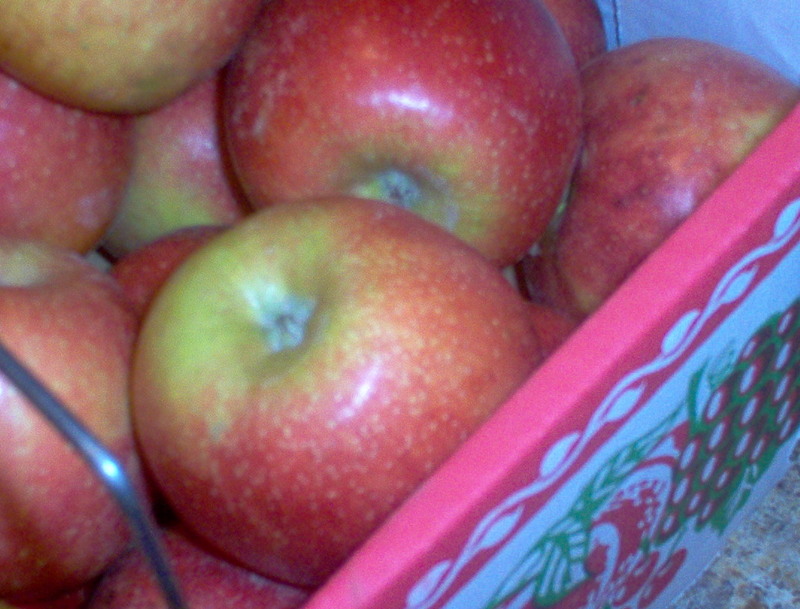 So yesterday, I went out to Amish country and came home with this beautiful basket of local apples. It’s ten pounds worth, and I know I’ll be going back for more. Any idea what kind of GAPS-friendly treats we’ll be trying out this week? Hmmm…I’m thinking almond-flour apple cobbler, cooked cinnamon applesauce, apple cider….I’m sure the list will expand as apple season goes on. The very-slightly-cooler, almost-fall days are stimulating my senses. I find myself continuously fantasizing about pumpkin candles, cider, warm cozy fireside evenings (if only we had a fireplace), lots of comfort food (usually involving carbs and grains, unfortunately), and so on. At least I can make the candles and cider happen! Quick re-cap of last week’s menu highlights: we loved the white bean chili. It was absolutely delicious and definitely crave-worthy. We also really, really, really, really loved these chocolate chip cookies. Yes, you read that right: but just in case, let me say it again. We ate real, delicious, crumbly-buttery-chocolaty chocolate chip cookies this week. They were delicious, and I am forever indebted to Elana’s Pantry for the recipe. It saved us just as we were all going a little crazy…and I found the recipe in time for the holiday Monday, so we all got to enjoy them fresh out of the oven. (For the chocolate chunks used in the recipe, I made this recipe for homemade, honey-sweetened chocolate. We ate the leftovers straight from the bowl, I am (not) ashamed to say.) I had tried another recipe for CCC’s a couple of weeks ago that did NOT work out very well…so these were a welcome hit. So…on to this week’s menu. We are all in a bit of a comfort-craving mood this week….I can tell by the things that Hubby and Little Guy keep asking for. So, I’m going to keep it simple and homey. Well, last week was pretty great. We had some great recipe successes, and some good family time. This post will have to be written fast as I have a fussy, teething baby who keeps waking up and wanting to nurse. So here are the highlights, and then on to the menu plan. This coconut flour pizza crust turned out fantastic! Everyone enjoyed it. It was nice and thin, with a great texture, and didn’t become soggy under the toppings. We’ll definitely be using it again! Thursday, Hubby and I celebrated our ninth anniversary, and I made this yellow coconut cake with cocoa buttercream frosting. It was fantastic. Everybody loved it, and to my surprise, it was nice and moist and non-crumbly, even though the only flour used is coconut flour. Yum! Friday night, I had planned to use spaghetti squash for GAPS “spaghetti”, but couldn’t find any. So I came up with these baked Italian meatballs…and all three of us enjoyed them. That was a relief. It’s not hard to find something that Hubby and I enjoy, but when Little Guy loves it too…believe me, it stays on the menu. So without further ado, here’s this week’s menu. A few quick comments from last week. The Italian meats casserole was a HUGE hit with everyone. That made me feel great. It’s not often that all three of us love the same thing! Over the past couple of days, I made a big batch of creme fraiche. Part of it I stored in the fridge to use throughout the week, and the other part I combined with raw honey and organic vanilla to make a pretty fantastic homemade, lactose free ice cream. And then last night, I got a craving for a savory baked good…and though I didn’t bake anything, I came up with these Savory Coconut Flour Mini-Pancakes. Everybody liked them so much I decided to give them a post of their own. I don’t have much time, so here is this week’s menu. Saturday: Breakfast: Flourless PB pancakes; Lunch: Leftovers; Dinner: Leftovers. This was a good week. The menu plan worked out great, and everybody seemed to enjoy most meals. I don’t have a lot of time to write today, so here’s a quick run-down, and then this week’s menu. The grain-free granola I made turned out great, but a little brown. I made it with sunflower seeds, coconut, honey, coconut oil, cinnamon, and raisins, and didn’t account for how much faster it would cook than the regular grain-filled granola I used to make. It was done in about eight minutes as opposed to twenty. At least I know for next time. I went to my local butcher’s this week and stocked up on good, clean meat. We don’t have a chest freezer, so I don’t keep as much meat on hand as some people I know. But our side-by-side is currently packed with two chickens, two roasts, a rack of ribs, a pork tenderloin, pork chops, five 2.5 lb. rolls of ground beef, two rolls of sausage, and of course the tons of stock I made last week. We’re good to go for a little while. these Cinnamon-Walnut Buttons, and these coconut/almond flour muffins. Both were a huge hit. The cookies are an amazing source of fiber and omega-3’s, and the muffins helped everybody satisfy that baked-good craving we’ve been developing. I’ll be making both again, probably this week. Hubby really liked last week’s lemon chicken and broccoli, and the cowboy stew. I did too. Little Guy didn’t care for either. I realized part way through the week that I didn’t do a very good job of gearing the menu to him (except for the flourless peanut butter pancakes!! they are amazing….just three ingredients, but really good topped with raw honey and butter), so I am trying to do a little better this week. I made more creme fraiche today, and made and froze some chicken stock with last week’s chicken carcass. This week, I need to make 24-hour yogurt….hopefully a big batch. We eat it FAST, and I plan on sweetening and freezing some for Little Guy this week. I also need to make banana bread, muffins, and cookies to last the week. Better get cracking! GAPS is going well. Mostly. We haven’t run into many issues. The biggest problems we have found are these 1) Little Guy has an enormous appetite these days, and filling him up without having grains available is proving to be a major challenge. (He doesn’t like nuts. If he did, it would help.) And, 2) Hubby wants to buy sugary things. And sugar- free things. And things with grain. Pretty much everything, in fact, that he can’t have. He did actually come home with something “illegal” today that promptly got put on a top shelf to be saved till after GAPS. Fortunately the item was shelf-stable. Anyways. I have some work to do today and tomorrow. We are out of several homemade staples that are probably going to be weekly-things-to-make. Today, I have a huge pot of stock on the stove (we used up all the stock I had previously frozen within the first week and a half of GAPS!) There is a spaghetti sqash baking in the oven for dinner, and I am about to add a pan of grain-free granola and a loaf of coconut-flour banana bread to keep it company. (May as well make use of that oven heat.) As the oven cools down, I will stick in a pan of yogurt to culture over the next twenty four hours. I also need to make ketchup and mayonnaise. I had made those before last week…but, again, we used them up faster than I had anticipated. Oh yes…and we’re almost out of creme fraiche. So….on to the menu. Like last week, we’ll be recycling some of our favorite recipes from this week in order to give the menu a modicum of familiarity. I honestly think that that is what is getting to Little Guy the most…he likes the food, but he doesn’t know what he can count on; everything has changed so much. He thrives on the routine and regular. Okay, so here goes. I have been doing weekly menu planning for a couple of years now. I have played around with different systems, as our family has changed (one children to two, hubby gone or home, all of us more or less busy), but I ALWAYS map out all my dinners for the week, at least two breakfasts, and a couple of basic lunches (usually planning on using dinner leftovers for lunches), and then make my grocery list from that. Over time, this has helped simplify my shopping, especially as obtaining my food has become a little more complex. We do still shop at our local large grocery store for quite a few things, but we buy our meat from our local Mennonite butcher, our free-range chicken (USDA certified) from his next-door neighbor, our local milk and honey from the little shop around the corner from them, and many of our vegetables from the farmer’s market. Add into all this the fact that we are sharing a car at the moment, and….well….a plan is ESSENTIAL. Now that we are on GAPS, it is even more essential than it has been. This diet is requiring a crazy lot of cooking. The cooking part I love, as you probably already know; it is fitting it in around the two kiddos and everything else that is a challenge. Three meals a day, condiments, ferments, homemade dairy products…you get the idea. A note before I post the menu: for those of you who are GAPS-savvy, we are NOT doing Intro. The GAPS intro diet is discouraged for breastfeeding women; it doesn’t provide enough calories, and the die-off effects can be harmful to the infant being fed. Also, Little Guy has some pretty serious texture issues, including a complete aversion to anything saucy, messy, soupy, soft, and so on. A diet of broth and mush squash just are not going to work for him! So we are going straight to full GAPS, with the understanding that both the bad bacteria die off and the much-awaited improvements may be a little slower than if we were doing Intro. This is just what is best for us right now. Like this past week, available snacks will include fruit (fresh and dried), nuts, and GAPS-friendly almond flour bread.